Hope you all had great weekends! It was very warm here this weekend 60 degrees on Saturday and Wednesday we are supposed to get snow ! 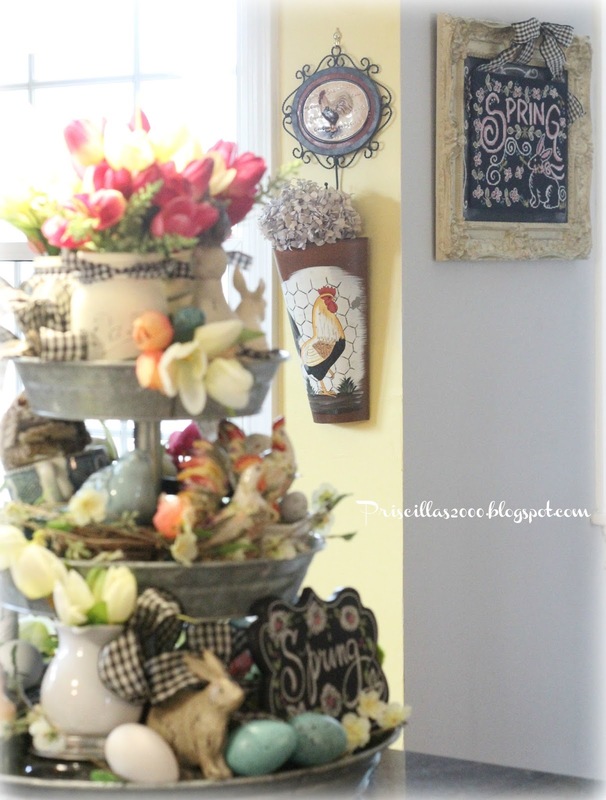 I was ready to move on from the Winter decorations ..so I decorated for Spring and I am loving it! The first place to get springed up was the galvanized tiered tray in my kitchen ..
Bunnies..chickens..eggs..birds..nests ..tulips..are all in here ..
A little Spring banner that I cut the S off in this photo :) This is the back of the tray..
A little rummage sale bunny that was 25 cents sits in the top with painted mason jars..black gingham ribbons and tulips decorate the jars.. 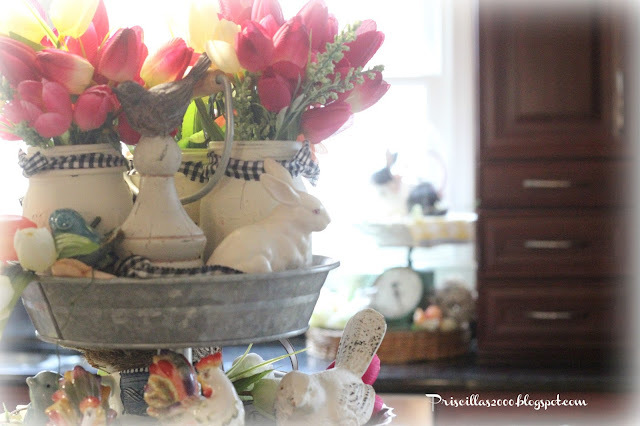 I love the tulips spilling out of the trays..
Little grapevine wreaths in transferware and china cups make great nests for the birds..
My daughter bought me these pretty pastelly chickens last year at Homegoods and they are front and center in the tray again this year .. well that's it for the tray tour.. there is a lot of stuff in there! Thanks so much for all your visits and sweet comments ! 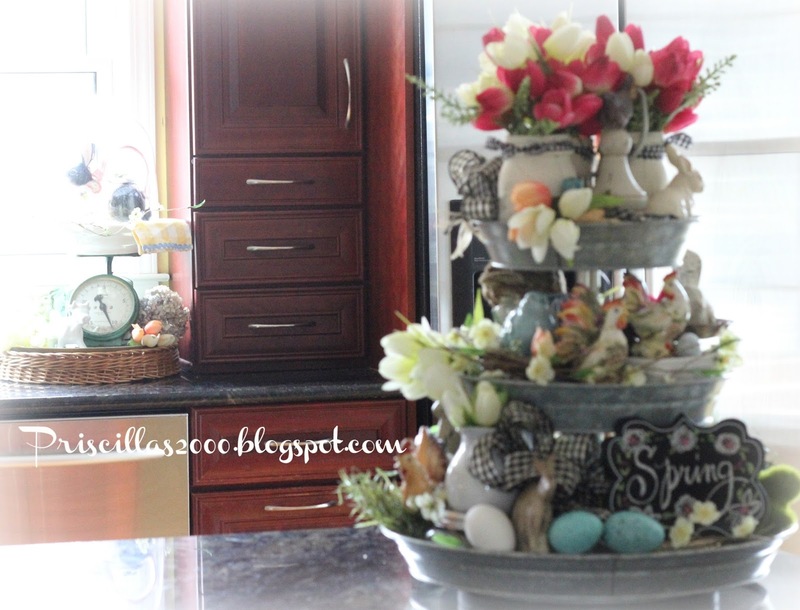 Oh I always love to see what you have decorated next!!! Great job!!! 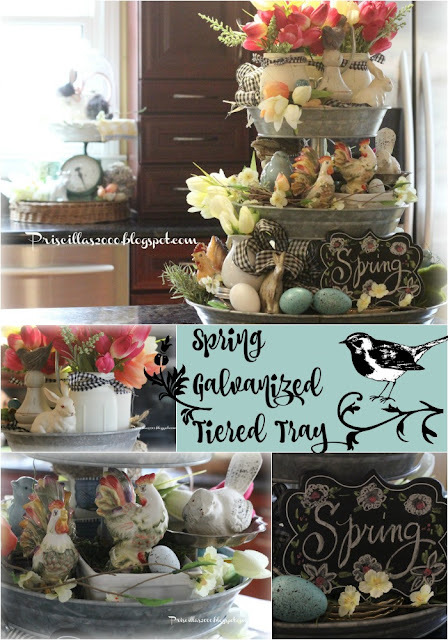 You come up with so many clever and pretty ideas for the tray. I just have to find me one. I LOVE the way you decorate your tiered tray and look forward to seeing the next one. 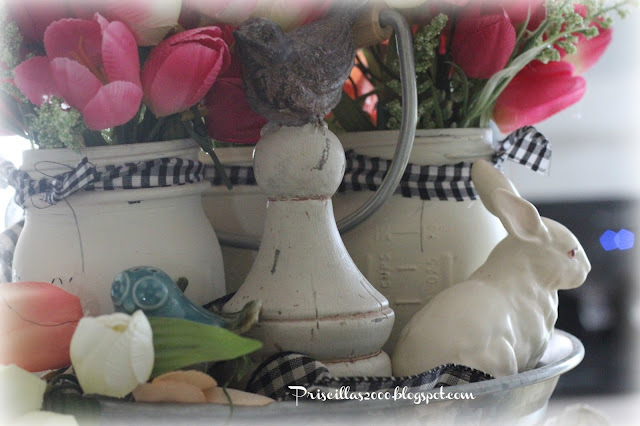 Another dynamite arrangement! 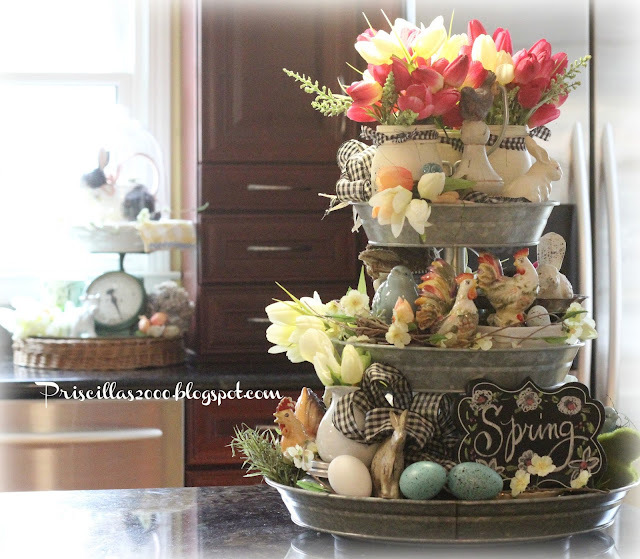 I decorated my 3 tier tray yesterday...will have to put up some pictures on my blog. Thanks for sharing. 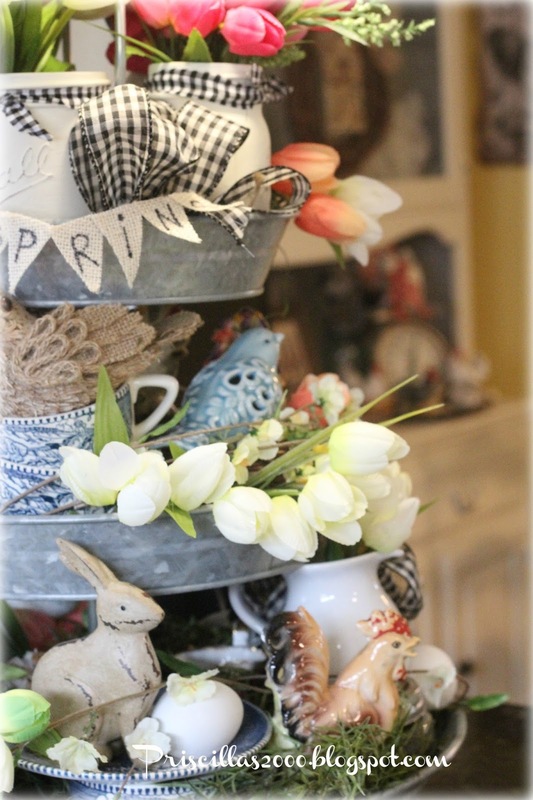 Spring has sprung at your home, Priscilla--love the tiered tray and all those bunnies :) Sure wish this warmer weather would stick around for a while! 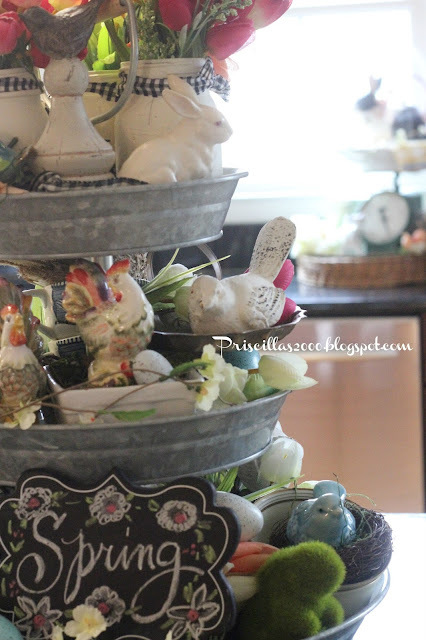 Your tiered tray really puts me in the mood for Spring, so pretty and cheerful. I love all the bunnies! That is a great piece for building a theme - love it! 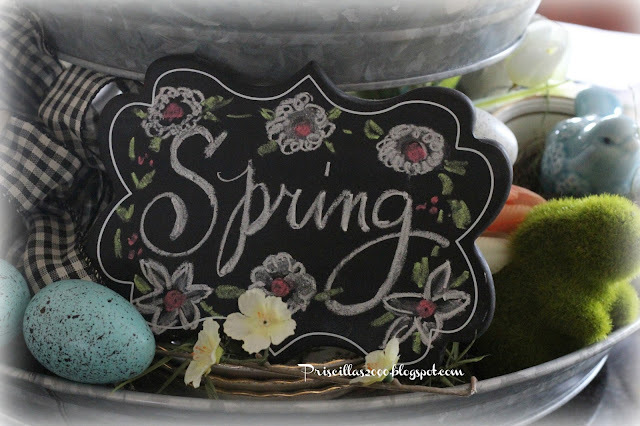 Thanks for the springy inspiration! I have a 3 tier tray and like to switch it up too. Yours is chock-full of cuteness. Yes! Spring has sprung! 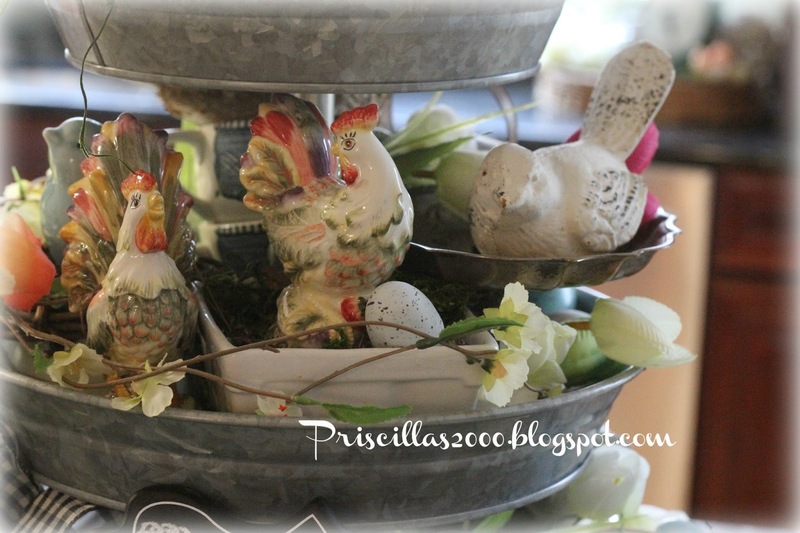 Your tray always looks terrific! Great job! 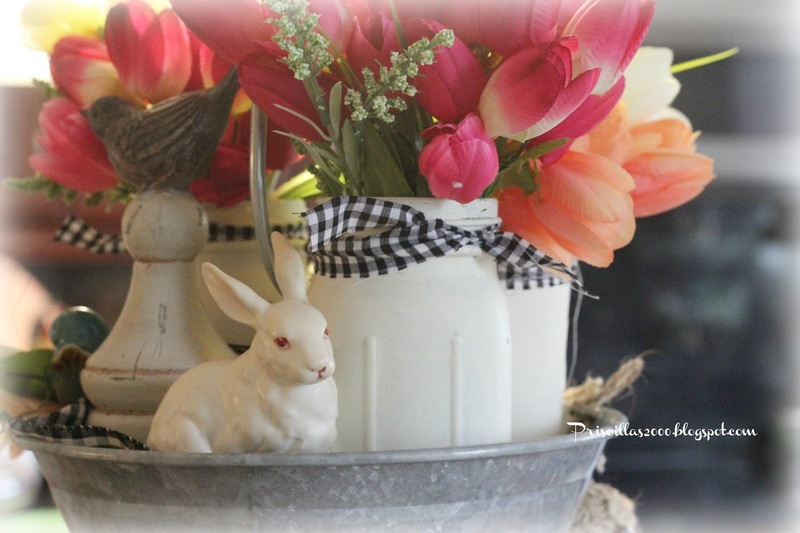 HOppy Spring! Ha! Get it?